Finding a wireless home security system that has all of the features you need and that meets your budget requirements can be tough. Sorting through all of the makes, models and extra “bells and whistles” can quickly get confusing and frustrating. In this article we’ll break down which features you really need (as opposed to those that just seem cool). Obviously the most important thing is to buy a wireless home security system that will let you know if someone is trying to break in to your home. It is also a good idea to find a system that monitors carbon monoxide levels. You should also look for a system that will monitor for smoke and fire because while smoke detectors are important, most security systems have sensors that are more sensitive and will warn you at even the slightest whiff of danger. The best wireless home security systems come with panic buttons. These are buttons that function almost exactly like the panic button on your car’s key fob. The primary difference is that, in addition to sounding an alarm, the panic button can also be programmed to alert your local emergency responders. This way you don’t have to worry about finding a phone (or worry about being overheard). Not all burglars or home invasions happen via your front or back door. Sometimes intruders will climb in through windows (often breaking them to gain entry). A good security system will allow you to detect intrusion via any entry point in your home. The better system can monitor for broken windows and access via pet doors. The best systems can be programmed to detect suspicious motions happening within the house. This is helpful in the event that someone manages to disable the entry point sensors without triggering the alarm. It is also helpful because it will keep children and pets from accidentally triggering the alarm after you have armed it. Wireless systems with pre-set settings are fine. Wireless systems that allow you to customize your settings are better. 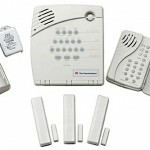 For example, a system that will turn on the lights as well as sound an alarm when someone breaks in is helpful. Buying a system that can be programmed to recognize your and your family’s voices is very helpful if you can’t get to a keypad or to your phone if you need to alert the authorities. This way if you get hurt while nobody is home you can still “call” for help. Do not buy a security system that is only powered via electricity. You need a system that can stay armed and powered on even during a blackout. Shop for a system that has a battery backup already in place. These are the features that you need to have in any security system you purchase for your home. Use them as your baseline when you start shopping.